Happy New Year and welcome to the very first One for the Road, a brand new guide to the month of Brit Wres ahead! We'll be focusing on one show for each week, whilst also showcasing a number of other events to make sure that wherever you are in the country, you know exactly the best places to go for your grap needs! This month we'll be starting with Revolution Pro Wrestling at The Cockpit in London on the 8th, before looking at Insane Championship Wrestling's first event of the year as they tape for Fight Club in The Garage, Glasgow on the 15th, before heading back to the capital for the final two weeks of the month, with RevPro holding High Stakes 2017 at the hallowed York Hall, Bethnal Green on 21st and closing up with PROGRESS Wrestling teaming with Germany's Westside Xtreme Wrestling at The Dome in Tufnell Park on the 28th. We've also picked out other shows from 4FW, Attack! Pro Wrestling, Britannia Wrestling Promotions, CSF Pro Wrestling, HOPE Wrestling, House of Pain Wrestling, IPW:UK, Ironfist Wrestling, PROGRESS, Pro Wrestling Chaos, RevPro and Wrestlezone. RevPro are kicking off 2017 in style with a bumper card of action for their twelfth Live at the Cockpit event. Some of the best talent in the country will be on display on Sunday 8th, in what promises to be a varied evening of the grappling arts. The main event is a star studded affair, as two makeshift tag teams collide when former British Heavyweight Champion "The Villain" Marty Scurll sides with former British Cruiserweight Champion Pete Dunne to clash with Shane Strickland and "All Day Star" Ryan Smile. You may struggle to find two wrestlers who had better 2016's than "The Villain" and "The Bruiserweight", as they both exploded on the world scene. However, in RevPro, Dunne found wins hard to come by after losing the British Cruiserweight belt to Will Ospreay last July, but he's had some world class competition and on the other hand his partner, Scurll, had a vintage year, picking up big victories over the likes of Jushin Thunder Liger, Ospreay and Martin Kirby. Strickland and Smile will be hoping that their similiar high-flying styles, as well as their clash last October, will help to create an instant chemistry to keep them one step ahead. No matter who kicks off 2017 with a victory, expect this one to be a thrilling clash of styles, that could very well blow the roof of the Cockpit! One of the most intriguing matches on the card is a collision between the hard hitting Trent Seven and the submission based Zack Gibson. 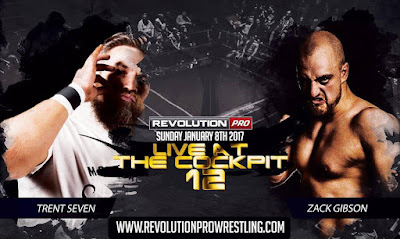 Seven has made quite the impact in RevPro since debuting last May, even challenging Zack Sabre Jr. for the British Heavyweight Championship, just a few months after making his debut. Gibson will be hoping that he'll be able to make a similar impression as he makes "Liverpool's Number One" makes his overdue debut. These kind of styles clashes can often result in fascinating matches and with both looking to find leverage within RevPro, things are evenly poised to create an absolute classic. The result could very well come down to who can withstand the most punishment. Dave Mastiff will make his first RevPro appearance since October 2014, as he clashes with Tyler Bate, in a match which I have dubbed the "Black Country Battle". Whilst Mastiff returns after suffering a heavy run of defeats to the likes of Doug Williams and Rampage Brown, Bate will be stepping into his first RevPro singles match with a point to prove. Despite Mastiff having an over 100 lbs weight advantage, Bate may be one of the strongest wrestlers pound for pound in the country and should be more than capable of holding his own against his more experienced opponent. Expect this one to be full of intense strikes, deceptive speed and tasty suplexes, as the duo meet for the very first time. Also on the show, Joel Redman and Charlie Sterling (Charlie Garrett) put their British Tag Team Championship against a returning London Riots (James Davis & Rob Lynch), Josh Bodom faces "The Pride of Wales" Eddie Dennis in a rematch from November, after losing the British Heavyweight Championship to Katsuyori Shibata, Zack Sabre Jr. looks to get back on track against RJ Singh, The Revolutionsists (James Castle & Sha Samuels) go up against Kurtis Champman & Josh Wall and Dan Magee takes on Rob Lias. 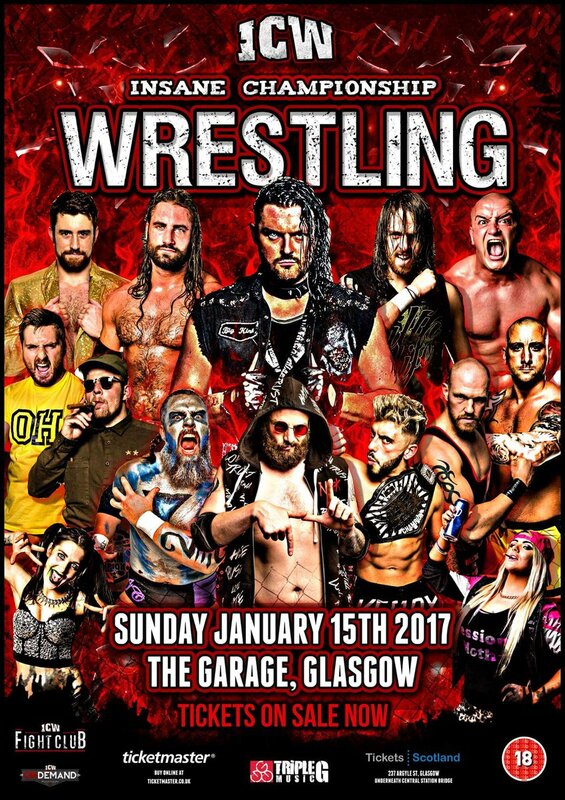 ICW's first show of 2016 see's them hit their regular haunt of The Garage in Glasgow for a taping of their Fight Club television show on the Sunday 15th. At the last Fight Club taping of 2016, Lionheart interfered in "Local Hero" Joe Hendry's bout with The Wee Man, hitting a superkick that would result in the upset loss. At the first taping of 2017, Hendry has the chance to gain some revenge on the former Zero G Champion as the two go one on one. Hendry is always entertaining with his wacky parody entrances, but he may not be in the mood for japes at The Garage after the embarrassing defeat that Lionheart handed him. Lionheart will be hoping that a victory over Hendry will put him back in the hunt for the Zero G title he lost at Fear and Loathing, but The Local Hero will not only want to get himself back on track but he'll want to dish out some pain. This could be a scrappy affair and may only be the start, but with the intensity levels rising it may be difficult to look away. Kid Fite has been engaged in a bitter feud with former The 55 stablemate Sha Samuels over the last couple of months, including a Falls Count Anywhere match that ended in a No Contest when Fite bundled Samuels into the boot of a car and drove off. However on the 15th, Fite finds himself against a rather different opponent in the shape of the high-flying Charlie Sterling (Charlie Garrett). Sterling impressed in his debut in Bristol, before gathering more support when making his Garage debut last month and it's clear that the Bristolian has bucket loads of potential. With Fite clearly pre-occupied with his war with Samuels and finding victories few and far between since the split of The 55, this could be the opening that Sterling needs to gain some momentum and perhaps look towards earning a Zero G Championship shot later in the year. 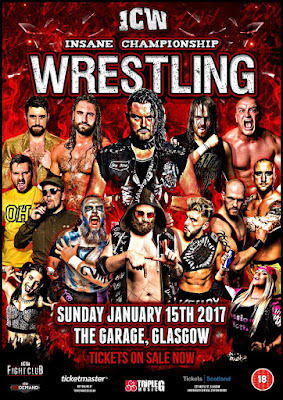 Chris Renfrew and Stevie Xavier are two ICW staples both looking to get back into the title picture, after both being unable to capitalise on big victories at Fear and Loathing in November. Renfrew suffered a #1 Contenders match loss to Trent Seven at the last set of tapings, whilst Xavier was unable to take the belt from Wolfgang at the same event. With the Square Go just around the corner, both will be looking to start rebuilding their momentum, which may make these two dangerous men, even more determined to pull out the victory and prove to Mark Dallas that they deserve to be in the mix. Add to that the years and years of history between the pair that's seen them align together in the New Age Kliq as well as wage war with various partners, there will certainly be no loved lost when they go toe to toe once more in The Garage! Also scheduled for the taping is Davey Blaze taking on DCT, Andy Wild and Lewis Girvan competing in the final of a tournament to crown a #1 Contender to Kenny Williams' Zero G Championship, Tag Team Champion Jackie Polo meeting Iestyn Rees, a Fatal Four-Way between Sammii Jayne, Debbie Sharpe, Kasey and "Session Moth" Martina where the winner will earn a shot at Kay Lee Ray's Women's Championship and "The King of the North" James Scott facing Christopher Saynt. 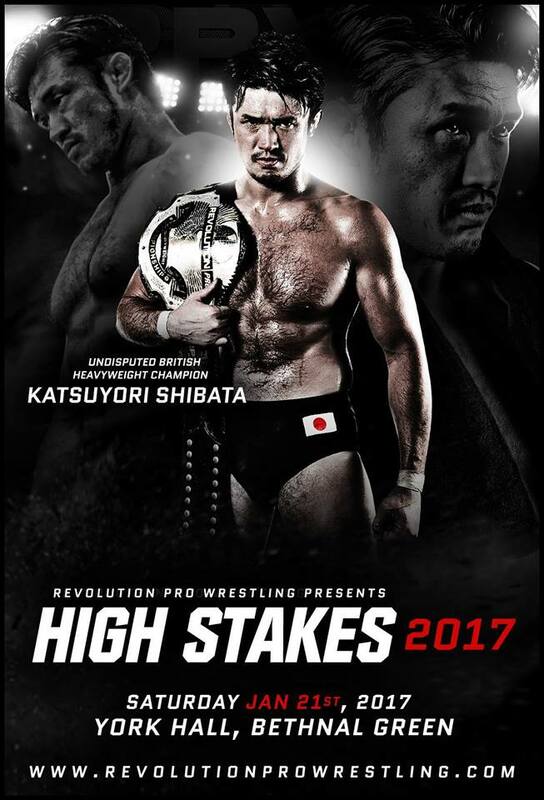 On Saturday 21st, RevPro host their first show at York Hall of the year, as they present High Stakes 2017. This event sees a number of big name international talent hooking up with some of the countrys top performers, including the return of British Heavyweight Champion, Katsuyori Shibata. Marty Scurll vs Zack Sabre Jr has been building and building within RevPro for a long time and on 21st at York Hall the pair will finally collide as the Leaders of the New School EXPLODE! The pair had been in a fairly uneasy alliance in 2016, tagging against the likes of Matt Sydal & Ricochet, but that all came crashing down following a loss Los Ingobernables of Japon (SANADA & Tetsuya Naito) in November when Scurll turned on ZSJ. Even when teaming, neither seemed to be able to agree with the others tactics when inside the ring, whilst the two have certain similarities in their will to win, it was clear that each had their own techniques to attaining victory. The two have come face to face in places like wXw, PWG and PROGRESS in the past, but when they come together in RevPro the York Hall may see their most intense masterpiece to date. This will be special. Shibata v Riddle. Like why should I have to write anymore? It's Katsuyori Shibata v Matt Riddle. British Heavyweight title on the line. Back Globar Wars UK in November, Pete Dunne suffered defeats to Yuji Nagata and Tomohiro Ishii on consecutive nights. He's also suffered losses to Will Ospreay and Ricochet in the later half of the year. Despite the 23 year old's rise in 2016, perhaps he just wasn't ready to tangle with NJPW's elite roster. Perhaps, things have changed in 2017? We'll find out if Dunne is up to task at High Stakes as he goes up against YOSHI-HASHI. The Bruiserweight will be desperate to prove himself, but YOSHI-HASHI won't exactly be a push over, after a banner year that included a G1 victory over Kenny Omega. The Headhunter will also want to make an impression on his RevPro debut. This may come down to who wants it more, but it'll be bloody fun to watch it all play out. Elsewhere on the show, Martin Stone returns to RevPro to face NJPW's Jay White, former TNA X Division Champion Trevor Lee collides with Trent Seven and Charlie Sterling & Joel Redman put their British Tag Team Championships on the line against former ROH World Tag Team Champions War Machine (Hanson & Raymond Rowe). 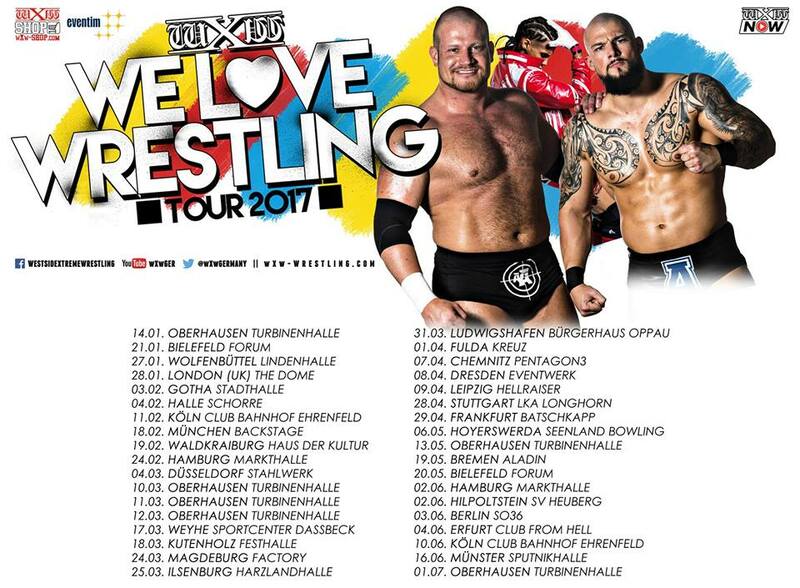 Rounding out January, PROGRESS is bringing Germany's best, Westside Xtreme Wrestling to London for the very first time with a stop of the We Love Wrestling Tour arriving at The Dome in Tufnell Park on 28th, just one day before PROGRESS' own Chapter 43: Tropic Thunderbastard in Camden. The main event will see one of Britain's finest getting a rematch for the wXw Unified World Wrestling Championship, a title he lost on the same night he won it, as "The Villain" Marty Scurll goes up against Axel Dieter Jr. The pair have gone back and forth over the last two years, picking up victories over each other in Oberhausen, Magdeburg and Hamburg, including competing in a brutal "I Quit" match as part of last year's 16 Carat Gold tournament, but when they clash in London with the title in the line, the stakes are higher than ever before. I'd expect the atmosphere inside The Dome to be very different from the pairs clashes in Germany and by the time the two come to the ring the place should be rocking, driving the pair to go that extra step, creating the potential for some real magic. This will be technical, vicious and personal, but most of all it will be wrestling that you just can't take your eyes off. 16 Carat Gold is one of the most respected tournaments in all of pro wrestlings, that produces some of the best wrestling of the year and has been one by some of the biggest names in Independent wrestling, El Generico, Chris Hero, Zack Sabre Jr, Bad Bones, Tommy End and more. At The Dome, Pete Dunne and Jody Fliesch have been given the opportunity to earn a place in the 2017 edition of the tournament as they clash for the first time ever in a Qualifying match. It's been over ten years since Fleisch wrestled in wXw against the likes of Claudio Castagnoli, PAC and Mike Quackenbush, but he returns looking to show that he can still keep up with one of this generation's hottest talents in Dunne. If The Bruiserweight can stand tall, this may very well be passing of the torch moment. Two former wXW Unified World Wrestling Champions will get an opportunity to show London what the promotion is all about as WALTER goes up against a man who only lost the belt last month, Jurn Simmons. With WALTER being the tag partner of current champ Axel Dieter Jr as part of Ringkampf, a victory for Simmons will send a real message to the new champion. Perhaps surprisingly the two have never met one on one, however there's plenty of history between the two over the last few years, fueding as part of The AUTsiders and Keel Holding teams in 2014-15, before eventually tagging together successfully in the tail end of last year. The familiarity should only act as catalyst for a hard-hitting fight as both look to prove that 2017 is going to be their year. Also announced for the evening is PROGRESS Tag Team Champions Moustache Mountain (Trent Seven & Tyler Bate) challenging for the wXw World Tag Team Championships against A4 (Absolute Andy & Marius Al-Ani. That wraps up this month's preview of the British wrestling schedule. Of course, there are many more events taking place over the thirty one days! To find out more about the shows we've highlighted here as well as all the others, check us out at www.wrestleropesuk.wordpress.com for the latest show and match announcements, British Wrestling event list, interviews, exclusive columns, reviews, reports and results! Labels: Axel Dieter Jr., Charlie Sterling, ICW, Joe Hendry, Katsuyori Shibata, Kid Fite, Lionheart, Marty Scurll, One For The Road, Pete Dunne, PROGRESS, RevPro, Ryan Smile, Shane Strickland, Wrestle Ropes, Zack Sabre Jr.